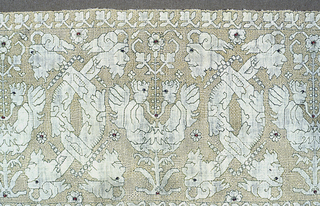 Linen border with silk fringe on one long edge, completely covered with deflected element embroidery in yellow silk; the pattern areas are reserved in the linen ground fabric, along with one long rectangle as if reserved for inscription. Paired confronted cherubs alternate with interlocking branches terminating in human heads at both ends. All motifs are outined in green silk; black beads for eyes; red beads as centers of rosettes.